The SPS300A/B intelligent pressure sensor and switch are microprocessor-based high-accuracy and high-function digital pressure detectors utilizing solid-state silicon semiconductor pressure elements. A liquid-filled dual diaphragm (SUS316L) and semiconductor-based pressure sensing elements are incorporated into the pressure detection unit. These detectors are used for gauge pressure measurement and to control air, vapour, inert gas and non-corrosive liquid pressures, and to indicate alarms. The SPS300 A/B is both available in wall-mount and panel-mounts models. The SPS300A is a pressure sensor with current output and relay contacts. 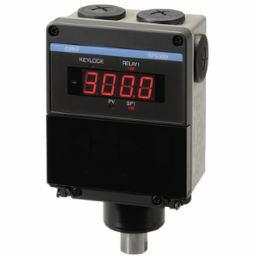 The SPS300B is a pressure switch which offers two-stage relay contact (independent) outputs.